High protein pastes are an adjunct to daily meals. Everyone knows a fat cat isn't really a healthy cat. But a skinny kitty can be just as unhealthy. Veterinarians often prescribe high protein supplements in the form of pastes to help cats with greater nutritional needs or those who need a boost in calories to maintain or gain weight. High protein pastes usually come in tubes and can be purchased at your vet's office or at most pet or retail stores carrying pet products. The advantage to these supplements is that high calories with complete nutrition can be given in low volume, which is especially beneficial for cats who don't want to eat or who can't eat large volumes. Pastes generally come in appealing feline flavors, such as tuna or chicken, making them quite palatable. Cats who have lost weight, or those who are in a recovery phase (such as after surgery or illness), can benefit from high protein pastes, but always consult with your vet before supplementing. Weight loss may be a symptom of a disease or some other metabolic condition. Cats with inflammatory bowel disease, fatty liver disease, cancer, hyperthyroidism or those who have recently undergone dental work and can't chew will especially benefit from the high-protein, low-volume paste. Do not supplement with high protein pastes if your cat is eating normally and hasn't lost weight. These formulas with their extra nutrition and fats can cause weight gain. The high fat content also can cause pancreatitis or diarrhea when a cat doesn't really need supplementation. Also, pregnant or lactating cats can be fed kitten food, which is high protein, or your vet may suggest adding supplements. 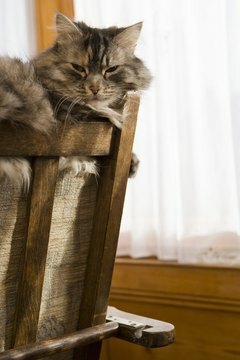 The rich protein may not be good for senior cats with compromised kidneys. It's usually best to give your cat a slow transition period when introducing the paste. However, if he has an immediate need, you won't have time to transition. Although, your cat may develop diarrhea, that's preferable to a compromised liver. Once his health issue is under control, and he gains or returns to his healthy weight, transition him off the paste over seven to 10 days, cutting back until you have him on his regular diet again.